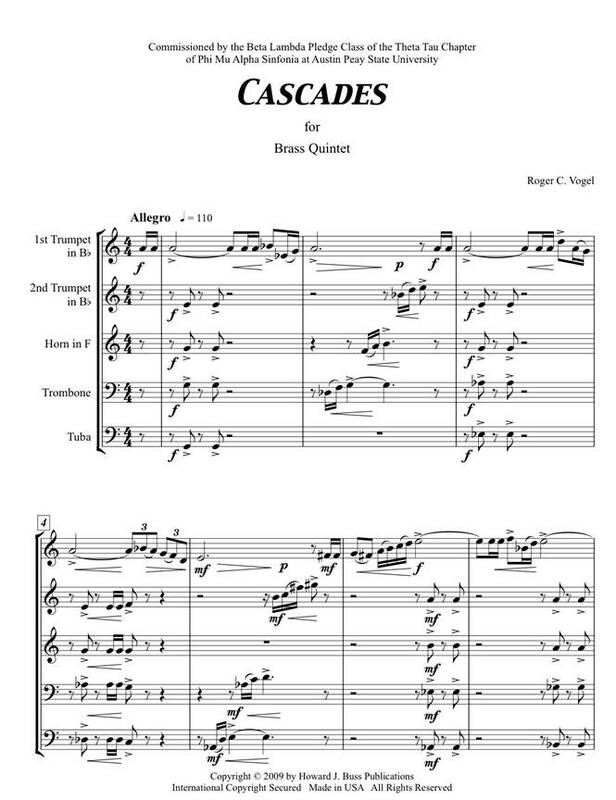 Cascades for brass quintet. Howard J. Buss Publications, (2009) Moderate.4 min. Listen. Concerto for Trumpet and Winds (Reduction for Trumpet and Piano). Wiltshire Music Company (2005). Advanced. 20 min. Cornucopia for multiple French horns. CP Press Publications, (1998) Moderate. 30 min. 2) "The Hunt" (a4) Listen. 6) "Waltz of the Venus Flytraps" (a4) Listen. Declarations for euphonium-tuba quartet (Adaptation of Declarations for contrabass quartet), Wiltshire Music Company. (2005) Advanced. 8. min. Listen. Eine Kleine Snailmusik for high voice, trumpet, 'cello, and piano. Howard J. Buss Publications. (1998) Moderate. 8 min. Fanfares and Flourishes for three antiphonal brass quintets. American Composers Edition (2004) Advanced. 11 min. Listen. Illuminations in Brass for solo trumpet and 6-part trumpet ensemble. Howard J. Buss Publications. (2004) Advanced. 10 min. Listen. Listen. Metamorphoses for trombone and piano. American Composers Edition. (1987) Advanced. 7 min. Listen. Night Moves for trumpet and piano. Howard J. Buss Publications, (2017) Moderate. 6 min. Listen. Outings for solo bass trombone. Howard J. Buss Publications. (2013) Moderate. 4 min. Listen. 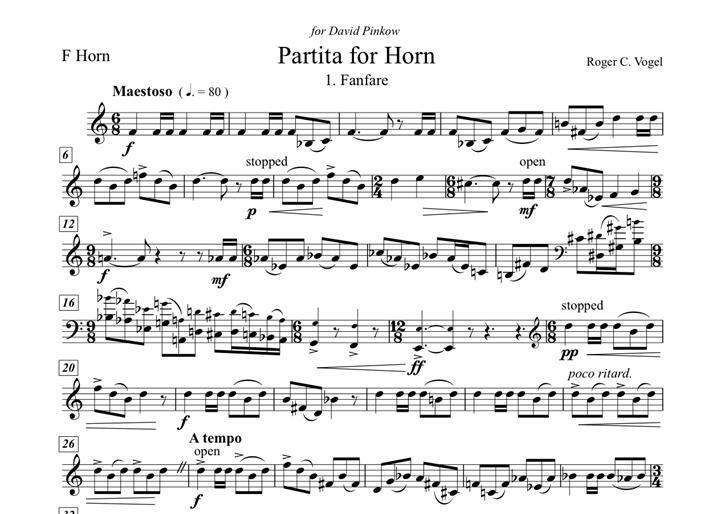 Partita for Horn. Tritone Press (1978) Revised 2011. Howard J. Buss Publications. Advanced. 9 min. Listen. Pas de deux for flute and trombone. Howard J. Buss Publications, (2010). Advanced. 9 min. Solar Lights for trombone and bass trombone duo. Howard J. Buss Publications, (2011) Advanced. 17 min. 2. The Full Moon. Listen. Stepping Out for trombone and and bass trombone duo. Howard J. Buss Publications, 2013. Moderate. (14 min.) Listen. Temporal Landscape Number 1 for tuba and piano. Shawnee Press. (1978) Advanced. 5 min. Listen. Temporal Landscape Number 4 for tuba and piano. Tritone Press. (1980) Advanced 5 min. Listen. The Frog, He Fly . . . Almost for high voice and C trumpet. Howard J. Buss Publications. (2000). Advanced. 5 min. Listen. Voyages for trumpet and Multiple percussion. Howard J. Buss Publications. (1997) Advanced.16 minutes.